Over 15,000 attendees each month and growing! Top billing as Presenting Sponsor on all promotional materials, including a specially created banner to be hung on Main Street. Media coverage in our advertising mediums— Radio, Social Media, Youtube. 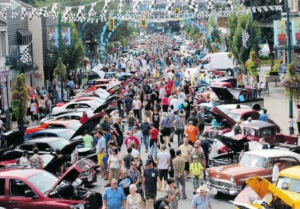 Complimentary entry of your auto(s) – up to 5 – into the Main Street Classic Car Show on June 7th. Complimentary entry to VIP reception suite with food and beverage in Greengate Village for up to 20 guests. Your logo presence prominently displayed on promo/advertising material for the event and during the event in the vendor area and on Main Street. Live Event Publicity Announcements about your company throughout the Car Show. Your logo on our website with link to your website. Walk-on appearance / speech during awards ceremony from awards stage. Logo(s) on Car show T-shirts and awards plaques, as well as logo on Streetfest T-shirts throughout the year. Mention on all promotional materials, including logo on banner to be hung on Main Street. Media coverage in our advertising mediums— Radio, Social Media, Youtube. Complimentary entry of 1 (one) auto into the Main Street Classic Car Show on June 7th. VIP Wristbands for 10 into The Silver Reef Beer and Wine Garden. Complimentary entry to VIP reception suite with food and beverage in Greengate Village for up to 5 guests. Your banners displayed on promo/advertising material for the event and during the event on Main Street. Logo(s) on Car show T-shirts and awards plaques. VIP Wristbands for 4 into The Silver Reef Beer and Wine Garden. Complimentary entry to VIP reception suite with food and beverage in Greengate Village for 2 guests.